Updated 01-22-15. Have a request or suggestion for a glossary term? Please leave a comment below. Also, Vietnamese banh mi is not pho, but I get enough inquiries about it so it's included here too. Okay it is not pho but I received plenty of questions about it so here it is. Vietnamese bánh mì or banh mi has two main meanings. One, banh mi in general means a loaf/slice/piece of bread, most often tied to the French baguette, but can also be used to describe sliced bread and other breads. Two, banh mi refers to the bread stuffed with a variety of meats, vegetables and pickles. In a Viet sandwich shop, you can buy the whole baguette banh mi, and also order the bread stuffed with meat banh mi. The word Bánh itself really has several meanings, but in this context it means any flour-, rice- or wheat-based food that is baked, cooked, or steamed (bánh ngọt means sweet cake, bánh bao means ball-shaped steamed dumpling, bánh chưng means rice cake, etc.) The word Mì also has several meanings (one of which is egg noodle) but in this context it means bột mì or wheat flour. Banh pho is the noodle used in pho dish. There are several sizes of banh pho available, ranging from a small width (1/16") to wider widths (1/8", 1/4" or sometimes even 3/8"). This is similar to spaghetti versus angel hair in Italian dishes. What differentiates banh pho from other noodle varieties is banh pho has square or rectangular cross-sections (depending on width size), as opposed to mostly round cross-sections most other noodles come in. 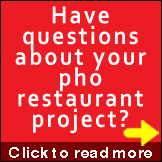 Read more on Banh Pho. Well-done sliced brisket. A meat ingredient in beef pho. Rare sliced eye of round steak. A meat ingredient in beef pho. Bo tai is normally included in the bowl when served, but can be ordered as a side dish (raw) to be cooked in hot broth at the table. Beef meatballs, sometime with tendons. A meat ingredient in beef pho. Can be ordered included in the pho bowl when served or as a side bowl in broth. Beef tendon. A meat ingredient in beef pho. Fatty brisket. A meat ingredient in beef pho. Flank. A meat ingredient in beef pho. Nước mắm or nuoc mam is fish sauce and the basis for many dipping sauce mixes used in Vietnamese cuisine. In its purest form, nuoc mam or fish sauce is a condiment that is derived from sea products (anchovies, squid, crab, etc.) that have been allowed to ferment. Literally, “nước” means liquid or sauce, and “mắm” means a sort of fermented fish-, squid- or shrimp-based, thick and saucy substance or paste often used to enhance food flavors through mixing or dipping. Vietnamese for beef pho, the most common type of pho. See this post: "What is Vietnamese Pho: Think You Know? Think Again"
Vietnamese for chicken pho, also a very popular type of pho. Boneless chicken pieces can be served as chunks in the noodle bowl, or as side dish (not boneless) with dipping fish sauce and ginger. Choice of white or dark meats. Free-range chicken is preferred. Phở is a Vietnamese soup noodle dish served in a large bowl that can be a meal in itself. Phở is a noodle dish and not a soup, and can be enjoyed at any time of the day and is not tied to any particular meal, early or late. See this post: "What is Vietnamese Pho: Think You Know? Think Again"
Beef tripe. A meat ingredient in beef pho. Crunchy flank. A meat ingredient in beef pho. Vietnamese word for Vietnamese, Vietnamese people or the Vietnamese language. 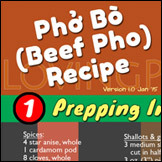 Viet and Vietnamese are used interchangeably on this site lovingpho.com. Found the site by accident. It’s interesting and fun. My favorite phở restaurant is called Trieu Chau, on University Avenue, in St. Paul, Minnesota. Fantastic soup. Incredibly cute help. I eat there about 80-100 times per year. Nothing beats having a bowl at night at the market in Saigon, though. Two bowls, two entrees and six 333 for about $14. Fantastic pho and cute help? What more could you ask for;) that’s why you go 100 times a year! Wow I’m craving for some Saigon night market foods right about now. Thanks for stopping by and sharing! Trieu Chau is in Saint Paul’s Little Mekong, where pho is everywhere! Little Mekong is on Facebook. Little Mekong: Thanks for stopping by and leave a message. I have taken your link off as we do not allow self-promotion on LovingPho.com. However, we’d love to support your business. You can contact us directly using the Contact Form. @Marc: In Vietnamese there actually are several meanings for phở: phở the noodle and phở the noodle in pho broth dish. The noodle, called bánh phở (see Banh Pho (Bánh Phở) – It’s All About the Square Noodles, can be used as the starch in many dishes that are not considered the Phở soup noodle dish. This is exactly the case with the dishes in your question. Both of these use bánh phở as the starch element in the dish. I’m not sure what “lan” means in this context (it could be lăn which is a stir fry method where you toss and roll ingredients in the pan as you cook,) but “phở xào” is just stir-fried pho noodle with a variety of meats and/or vegetables. An analogy is the Chinese chow fun or the Pad Thai dish, both of which use banh pho rice noodle of varying widths. Regarding Phở sốt vang, I think this is a popular dish in North Vietnam consisting of beef and lots of tendons in sauce/broth. In the context of this dish, sốt is the Vietnamese half-translation of the word “sauce”, while vang is the wine used in making the sauce. I have never had phở sốt vang or even seen it, and cannot confirm if this is a stew or a broth. In Vietnamese cuisine, we do have “bò kho” which is a very tasty beef stew that can be enjoyed with white rice, vermicelli rice noodle, banh pho noodle or banh mi bread. Phở sốt vang may be more similar to bò kho than the pho noodle in broth that we all know, as I’ve seen photos of it served not only with banh pho but sometime with banh mi as well. The latter is called banh mi sot vang. This leads me to believe bò sốt vang is another beef stew with a wine sauce. Someone more knowledgeable about this sot vang business please share with us your wisdom. Many thanks. And thanks for an interesting question. Did you have pho sot vang, and where did you have it? Hi, I noticed that some road names in Hanoi start with the word Pho. This pho is different from the noodles pho right? How is it pronounced? And does it mean road or street? Thanks! @Foong: Great question! I’ve seen this confusion in recent years as more people visit Hanoi and learn more about North Vietnam. In North Vietnam, the word you’re referring to is phố. It is definitely not phở. Phố is pronounced “foh” with an up trailing accent. Yes, it is the same foh that many people claim as pronunciation of phở. It is not. That’s the reason I’ve been advocating correct pronunciation, otherwise things get out of hand 😉 Phố means street, district, or can also mean house or apartment. A common phrase we still hear today is “Hà Nội xưa có ba mươi sáu phố phường,” which means “Old Hanoi had thirty six streets and districts.” For many Vietnamese, and especially for me even though I’ve never been to Hanoi, this phrase gives an immediate warm feeling of home, of the familiarity, of being Vietnamese. @Foong: You are very welcome. Great question. And hey, I like your blog too. good stuff! I found your website while looking for phở recipes. I have one attempt at making phở under my belt. I was blown away. I thought for sure it would be horrible. It was good. I got a little carried away with the rock sugar so it was a little sweet. Other than that, it tasted…..like phở! That attempt was about a year ago. I’m going to give it another try tonight so that I can enjoy it tomorrow night! I have phở at least twice a week. And, when I’m not enjoying a big steaming bowl of phở, I can almost guarantee that I have my hands on a grilled pork Bánh mì! @Saxmanrios: Yep, too much rock sugar can do that, but it’s no big deal right? I’m sure your next pho batch will be great. Making pho is not hard and you proved it. Are vè dòn and nạm different cuts of flank steak (outside vs. inside flank, for example), or are they the same cut, just cooked differently? Are there vietnamese words to distinguish between outside and inside flank? Sometimes I see “skirt flank” on pho menus. Does this refer to vè dòn specifically? Thanks! @Lucas Turner: As far as I know, vè dòn and nạm (crunchy flank and flank steak) are both from the flank, with the only difference being the tough membrane on the flank is left on to give you the vè dòn. When cooked properly, this part gives you the crunchy texture, hence the name. I’m sure there are Viet words to distinguish outside and inside flank, but for the vast majority of people not in the meat business, including many pho restaurant operators, it’s not a common knowledge. I myself do not have such specialized knowledge. I’m sure if you talk to a Viet butcher or someone in the beef trade, you can learn of the names. If you stop and ask people in the street if they know what outside and inside flanks are, I think you may find almost 100% wouldn’t even know or aware of such things. What you see on pho menus depends on what length the owner of such restaurant go to translate an item to describe the ingredients in his pho. If you see “skirt flank” on a menu, then I’m pretty sure the person made some effort to translate it pretty much verbatim. 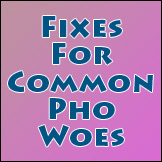 The fact is most pho restaurants use similar suppliers, and mislabelling can be rampant. So I’m not convinced that “skirt flank” is anything special, and it’s not necessarily the vè don you’re referring to. It may be, and it may not be. I hope this helps but I do not have definitive answer for you on this question. What are the different Vietnamese words for the white chicken meat and the dark meat used in pho ga? @Joh: Thanks for the question. In Vietnamese language I don’t think we refer to chicken meat as white or dark. We just call them what they are. The words for white meat in Vietnamese is ức gà which translates to “chicken breast”. For dark meat it’s đùi gà, which translates to “chicken leg”. I think it’s the same đùi gà for thigh.